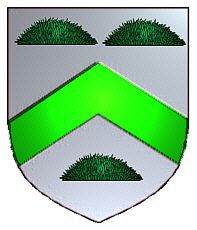 Coat of Arms: Silver with a green chevron between three molehills. Motto Translated: Possessing our ancient honour. English spelling variations include: Shakerley, Shackerly, Shackerley, Shack, Shick, and many more. First found in Lancashire where they were seated from early times and their first records appeared on the early census rolls taken by the early Kings of Britain to determine the rate of taxation of their subjects. 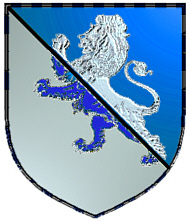 Coat of Arms: A shield divided per bend silver and blue with a lion rampant counterchanged. 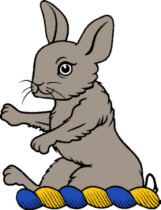 German spelling variations include: Schick, Schicke, Schicker, Schickel and others. First found in the Rhine valley. Early records include Albrecht Schiko, a citizen of Koeln (Cologne) in the year 1150, as well as Herman Schicke, who was a knight near Frankfurt in 1244. Some of the first settlers of this name or some of its variants were: Anna Catharina Schick, who arrived in Pennsylvania in 1749; Christian Schick, who was on record in Philadelphia in 1753; Erhardt Schick, who arrived at the port of Philadelphia in 1753. Some of the first settlers of this name or s ome of its variants were: John Shakley, who settled in Virginia in 1650; Adam and Jacob Shack, who arrived in Philadelphia in 1751; as well as Henry Shocklier, who was Naturalized in Philadelphia in 1739. 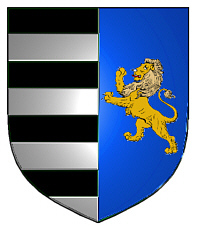 A shield with black and silver stripes on one half, the other half is blue with a lion rampant.